World War I was the crucial event of the 20th century, as the great European powers-- which until then dominated the world economically, militarily and politically-- destroyed themselves. That led to a second war a generation later, enabled the ascendance of the United States and Soviet Union, and unleashed the forces of nationalism and self-determination around the globe. On the battlefield the war ushered in the age of the internal-combustion engine and wireless communication, making factories and science as important as manpower and generalship. In the midst of all that, politicians and generals still had a war to win, and soldiers a war to fight. Crowns in the Gutter provides a concise analysis of the strategies and tactics employed to to try to achieve those goals. The chapters cover the entire war chronologically. They weave together the campaigns and battles with political events, improvements in weapons and changes in combat methodology, into one seamless story. The narrative also has dozens of maps and diagrams to further illustrate all the action of the first total war. 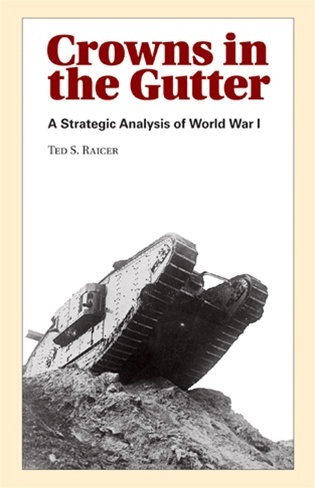 Crowns in the Gutter by Ted Raicer covers the whole conflict known as WWI in great detail. The narrative not only tells you what happened, but also the why's, and shows any connections with other fronts at that time. It not only covers the well known Western Front, but also the Eastern Front , the (often forgotten) Italian Front and the lesser known battles in Africa. Key figures are described in separate text boxes, as are the air war and war at sea. The emphasis is placed on the land war. Special text boxes describe some tactics, weapons and organizations in more detail, telling you what influence this had on a battle or the war in general. If you are looking for a book that covers this great conflict in a single volume, then this is it. Illustrated with clear maps that help you to understand the maneuvers, clear text and a well written birdseye view.